After six years of fighting a David vs. Goliath battle against fracking in New York we have so far managed to hold back the gas companies and maintain a defacto moratorium. But a decision on fracking could be coming soon. Governor Cuomo recently said, “I will make a decision on fracking before the 2014 election.” That is why we are calling on you to come to Albany for an anti-fracking rally on June 17th. There is no better way to show the Governor our resolve to keep fracking out of New York than by bringing thousands of determined activists to his doorstep. While our success has been notable and could not have been predicted when we started this fight together in 2008, the powerful gas and petroleum stakeholders in the Marcellus Shale are betting that the Governor will decide to approve fracking. They are getting ready by building pipelines, compressor stations and storage facilities. New York State needs to invest in our renewable energy future instead of building the infrastructure for the exploitation of dirty fossil fuels like natural gas. New York stands at a crossroads; this is our moment to decide the course of history. Please sign up HERE to RSVP and for preliminary transportation options. Please sign up HERE to RSVP on FACEBOOK and SHARE. Download the NY CROSSROADS FLYER. On Wednesday, June 17, 1885, the Statue of Liberty arrived in New York Harbor, where she has stood as our nation’s symbol of freedom ever since. 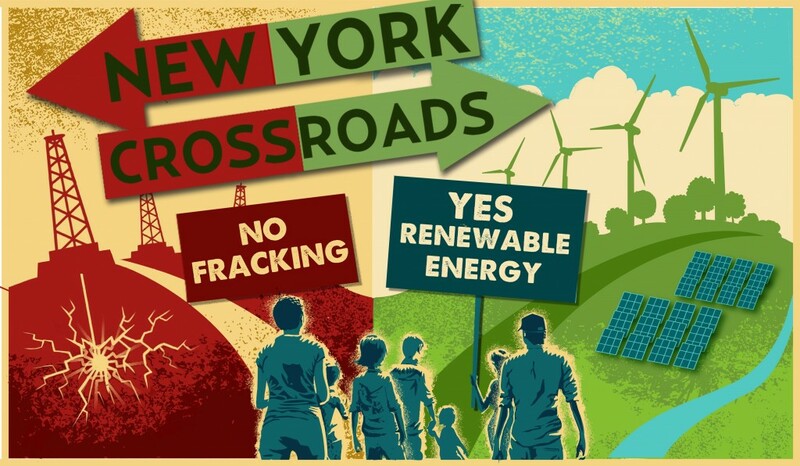 On Monday, June 17, 2013, citizens from across New York—from Long Island to Niagara Falls—will arrive in Albany to demand freedom from dirty energy, calling on Governor Cuomo to reject fracking and lead the nation in constructing a renewable energy economy here and now in New York. At this march and rally, the anti-fracking movement will, for the first time, join with business leaders, faith leaders, health professionals, elected officials, farmers, and youth to demand the renewable energy jobs that our families and communities want and deserve. New York is at a crossroads. In one direction: more ruinous dependency on dirty, dangerous fossil fuels. This path requires we blow apart the bedrock of our state and inject it with toxic chemicals. Providing only temporary, dangerous jobs, it leads to accidents, explosions, poisoned water, polluted air, contaminated food, public health disasters and climate catastrophe. This road chains us to the past and ransoms our children’s future. Running in the other direction is the road to renewable energy based on wind, water, and sunlight. This path leaves our communities unfractured and provides long-term, safe jobs to New Yorkers. This path creates an infrastructure that will not cost us the water we drink, the air we breathe or the health of our children. This path will make New York a leader in energy independence and, once more, a beacon of hope for the world. This path is the one we demand because our lives literally depend on it. We agree. Here in New York, where we have watched our subways fill with seawater and witnessed Hurricanes Irene, Lee and Sandy wash away our communities, we now call on our governor to reject the climate-destroying practice of fracking and take aggressive strides towards a 100% renewable energy economy. On June 17th, we invite people from every corner of New York State to gather at the State Capitol in Albany. Here, we will stand united to demand that Governor Cuomo reject fracking and blaze a trail to a renewable energy future. While our success to date to stop fracking has been a landmark achievement, it is unfortunately not a precursor to successfully preventing fracking in New York State. We haven’t come this far to fail in the last stages. We need your help to make sure that Governor Cuomo continues to feel the pressure of millions of New Yorkers who are against fracking in our state and who will consider his stand when he runs for reelection. Join us for this historic event as we rally in the East Capitol Lawn and march in the streets surrounding the Capitol building. The moment of power is now! Sponsored by: New Yorkers Against Fracking, Food & Water Watch, Frack Action, Catskill Mountainkeeper, NYPIRG, Citizen Action of New York, Environment New York, United for Action, Citizens Environmental Coalition, Alliance for a Green Economy, Sierra Club-Atlantic Chapter, Catskill Citizens for Safe Energy, Save The Southern Tier, and many more to be announced! Thank you and see you in Albany! Please share this email with your friends, family and neighbors so that they too have a voice in this decision. Thank you so much for what you have already done, and your continuing support. Catskill Mountainkeeper is totally reliant upon the financial support of those who share our conviction to prevent fracking in New York. This entry was posted in Event Archive by Mountainkeeper. Bookmark the permalink.